Warriors’ zealots pay $100 for every home game, but there’s one small catch – no seat is included. Fanatics watch on T.V.s throughout the arena but there are no views of the court, not even obstructed ones. An added bonus, fans are encouraged to purchase outrageously priced food and souvenirs. The Warriors created the most expensive sports bar on the planet. Professional sports leagues are relative novices at screwing their customers. Wall Street is light years ahead of the NBA and NFL. Constructing high-expense financial industrial complexes is part of its DNA. Every day, investors are conned into paying for things they don’t need or won’t receive. Instead of $10 water bottles and $20 burgers, clients are sold products containing egregious layers of unnecessary fees. Wall Street’s game pass makes the Warriors’ deal look like a low-cost index fund. 12b-1 Fee – This pays salespeople commissions to sell mutual funds. Clients pay the fund’s marketing costs, which helps increase the fund’s size. When mutual funds grow too large, performance suffers; fund companies benefit, investors lose. 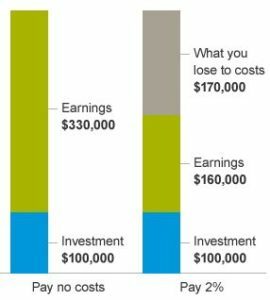 Class A Shares – Clients pay upfront fees of up to 5.75% for mutual funds that are almost guaranteed to underperform basic index funds (which cost pennies on the dollar). Class B Shares – This is Wall Street’s trick to deceive investors into believing they are avoiding upfront commissions. High fees are baked into the annual management expenses. In Wall Street speak – eliminating a fee increases it. Mortality And Expense Risk Charge – This fee is found on many variable annuity products. This protects investors from the risk of dying and having beneficiaries receive less than their original balance (including all premiums). Markets go up over long periods of time. Meteor insurance isn’t a wise purchase; neither is buying protection betting the world economy won’t grow over several decades. Portfolio Loans -Broker-Dealers double-dip by charging for account management and the corresponding portfolio loans (which includes the added benefit of putting your retirement at great risk). The Warriors’ recent success enables them to charge exorbitant prices. Fans believe the victories and championships will keep flowing. They willingly pay for a piece of the experience. Conflicted salespeople are trained to entice customers into thinking good or bad times will continue indefinitely. They pitch the products to cure your financial worries or to keep your adrenaline pumping. Both solutions come at a steep price. Investors should pass on arena gambits and high-fee investment products. It’s hard to enjoy games when you can’t see them. The same can be said for investments that prohibit you from making money.